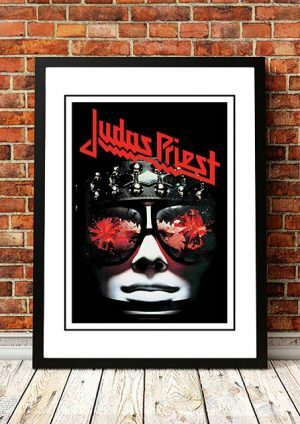 Classic Judas Priest Band Concert Posters and Memorabilia! Buy Online Now! Judas Priest were one of the most influential heavy metal bands of the ’70s, spearheading the New Wave of British Heavy Metal late in the decade. Decked out in leather and chains, the band fused the gothic doom of Black Sabbath with the riffs and speed of Led Zeppelin, as well as adding a vicious two-lead guitar attack; in doing so, they set the pace for much popular heavy metal from 1975 until 1985, as well as laying the groundwork for the speed and death metal of the ’80s. Formed in Birmingham, England, in 1970, the group’s core members were guitarist K.K. Downing and bassist Ian Hill. Joined by Alan Atkins and drummer John Ellis, the band played their first concert in 1971. Atkins’ previous band was called Judas Priest, yet the members decided it was the best name for the new group. The band played numerous shows throughout 1971; during the year, Ellis was replaced by Alan Moore; by the end of the year, Chris Campbell replaced Moore. After a solid year of touring the U.K., Atkins and Campbell left the band in 1973 and were replaced by vocalist Rob Halford and drummer John Hinch. They continued touring, including a visit to Germany and the Netherlands in 1974. By the time the tour was completed, they had secured a record contract with Gull, an independent U.K. label. Before recording their debut album, Judas Priest added guitarist Glenn Tipton. 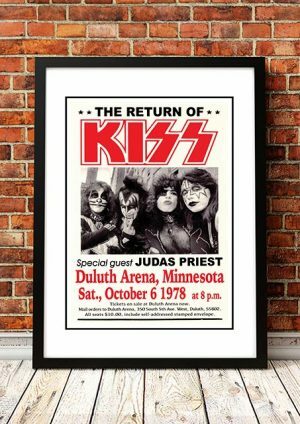 We stock some awesome Judas Priest Band Concert Posters.